Charles Francis Annesley Voysey was born at Hessle, near Hull in-Yorkshire, the son of a schoolmaster who become Vicar of Healaugh; who was tried as a heretic for denying the doctrine of everlasting hell and deprived of his living. 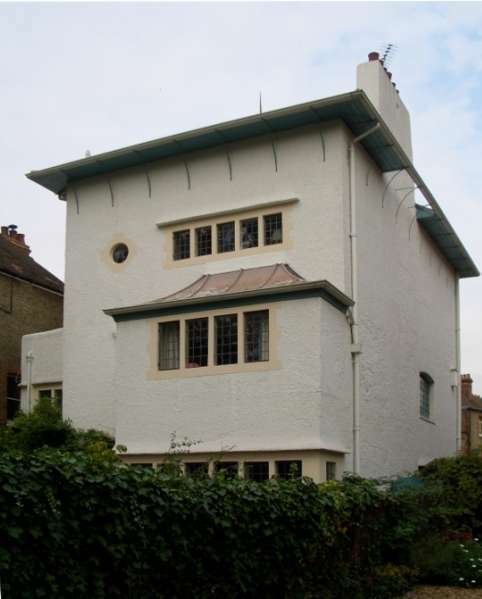 Voysey was educated by his father, who was a most important influence on his life, then briefly at Dulwich College. In 1874 Voysey was articled to J. P. Seddon; he remained in the office first as a pupil and then as assistant until 1879. After a short time in the office of Saxon Snell, he accepted an offer to join the stuff of George Devey as assistant. In 1882 he set up his own practice in Westminster carrying out surveys and alterotions. In the following years he concentrated mainly on decorative work and was a founder member of the Art Workers' Guild in 1884. From 1883 he concentrated on designs for fabrics and wallpapers until his first architectural commission, a house for M. H. Lakin at Bishops' Itchington in 1888, led to further offers of architectural work The characteristics of his earlier style, inherited from Devey and Norman Shaw, soon gave way to the more uncompromising manner for which he is better known. Architect-Designers from Pugin to Mackintosh. Exhibition catalogue. London: The Fine Art Society with Haslam & Whiteway Ltd., 1981. P. 32. Brandon-Jones, John, et al. C.F.A. 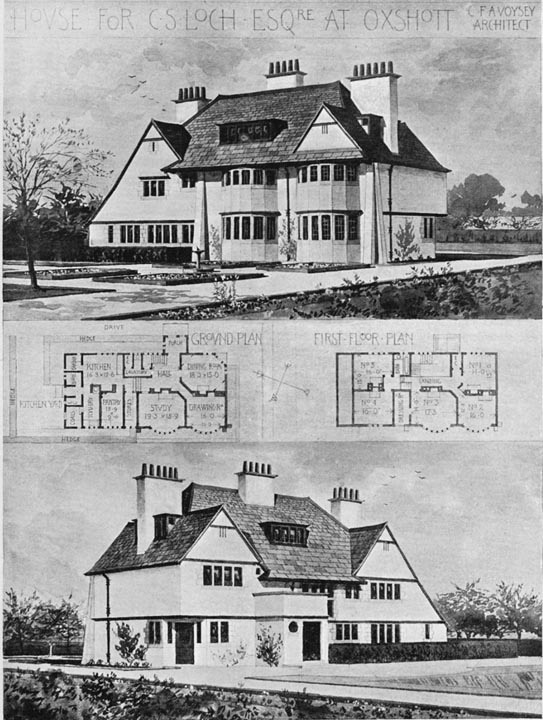 Voysey: Architect and Designer, 1857-1941. Bradford, Yorkshire: Lund Humphries, 1978. Gebhard, David. Charles F.A. Voysey, Architect. Los Angeles: Hennessey & Ingals, 1975. "Townsend, Horace. "Notes on Country and Suburban Houses designed by by C. F. A. Voysey." The Studio 16 (1898): 157-64. Illustrated on p. 162.